Do you set goals for yourself and then reward yourself for meeting them? I did this once before. In 2007/2008 when I lost weight, I told myself that every ten pounds I lost I would buy myself a new piece of workout apparel. The first ten pounds I lost I got a fleece warm up outfit, and the next ten pounds I think I got sports bra. The reward system worked soooo well that I forgot about it and then didn't buy myself anything for the next ten pounds. It was really exciting and motivating at first though, and then my health and the way I looked became more of a reward than buying things. 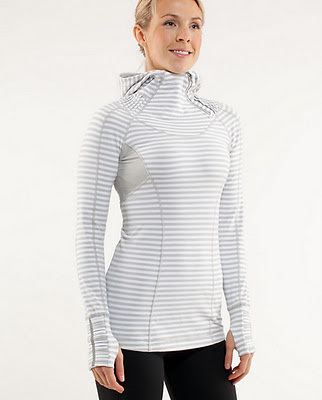 I was looking around on Pinterest and saw a few pieces of Lululemon clothing that I thought would be awesome for outside running. I went on Lululemon and quickly realized that I can't afford even their hair ties. Pretty outrageous. I was thinking about how to justify spending money like that on a piece of outerwear, and I think I came up with a reasonable goal. My goal is to run for thirty minutes without stopping. The most I've done so far is thirteen minutes, and that was a near death experience. I decided that was a tough enough goal that I could justify spending the $108.00 on this jacket (or one similar). Chances are I won't be able to wear it this year, but I'll have it for outdoor winter running next year. I also saw this idea via Pinterest today. That looks like a great way to save up $108 dollars. Get ready for 108 more workouts, Ingrid.